Again at Medialab-Prado for a workshop, last time we held a two-days-build- your-own-light-harp session. This time I joined as a collaborator on Demodrama, one of the HelloWorld! projects. 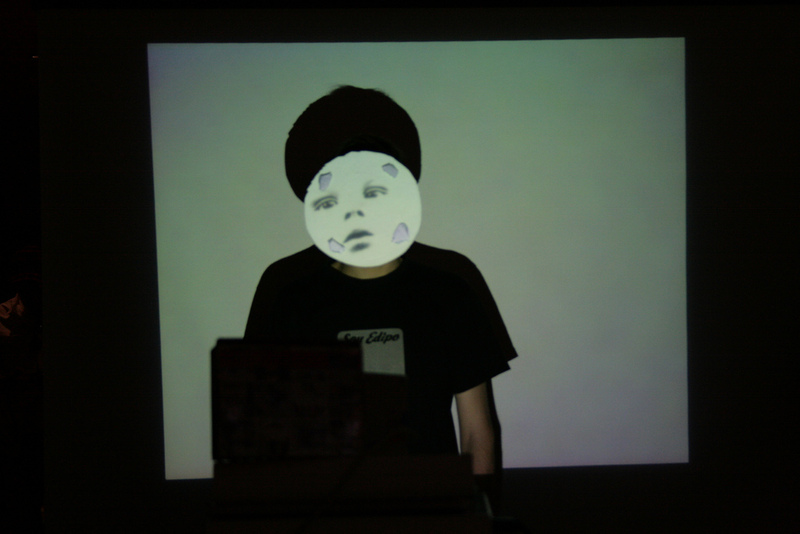 During their presentation, the siblings that started the project, said that one of their original ideas were to use an EEG-machine as a possible controller for the mask. A perfect project to test my machine. I really enjoyed the talk that Zachary Lieberman gave about his search for jaw dropping moments when making interactive pieces. Demodrama uses the same infrared camera trick as we used with MouseMan, but the software is tBeta. It comes with libraries that tracks, calibrates and reproduce image and video, but a bit too much C ++ for me. The system of projecting green dots in the space that you later mark for the camera is the best. Thinking back I really don’t know how we managed to calibrate MouseMan that good without something like this. It was originally thought to be a work with digital masks, but in my opinion it became more of a face as screen. No longer a tribal/animal mask with the head working as an extension of the body, but a free-floating white wall/black hole machine. My inital scepticism towards the lack of physicality, it is only a surface loosely connected to the head, was brought to shame when we saw the thing working. This will be magical.